“Friar Hugo, old friend, brace yourself. I am the bearer of tragic news!" Alarm spread across Hugo's pudgy features. "Tell me, Jess. What dreadful thing has happened?" 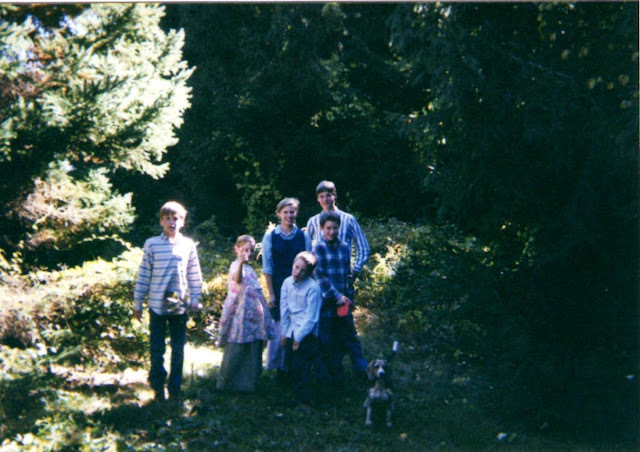 Our motley crew, playing in the woods behind our house circa 1999/2000 (before the four youngest arrived on the scene). When I was growing up all six of us children were huge (understatement) fans of Brian Jacques' Redwall books. Not only did we read and re-read them while eagerly waiting for the next book to be released, but we played Redwall as well. Yup, that's right. We each would pick a character to be and take off into the woods behind our house to build tree houses and forts. Of course we had an Abbey, that had not only stone walls and ramparts to defend but also a "dining hall" with long wooden tables to eat at. Without fail almost every time we were playing someone would head off to the house to throw together a pot of Hotroot Soup (back in those days our soup was a very basic version of it) and then carefully carry it outside for us to sip in our "great hall" in the heart of the Abbey. 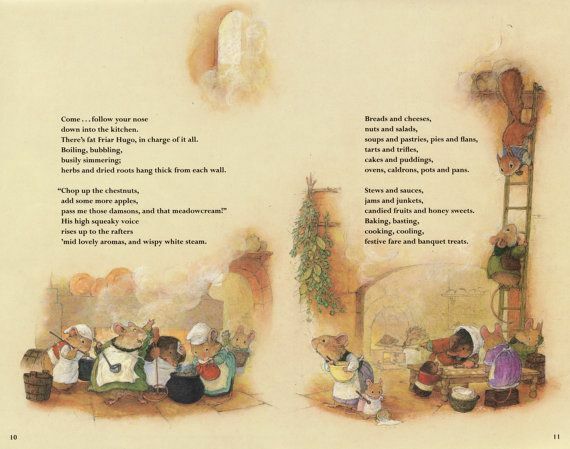 In case you've never had to pleasure of reading the Redwall books I'll fill you in. Hotroot Soup is a favorite meal among the otters of Redwall and is made of root vegetables and a certain "hotroot" pepper. Even those among us (who shall remain un-named!) that usually had a rather strong dislike for strong/spicy foods gobbled it down with relish. To this day I'm still not sure if it was the game of pretend, the fresh air, or the soup was just that good, but whatever it was we all loved eating it. Anyway, Adam had never experienced the wonders of this delicious meal and after deciding it was high time he did* I made a pot of Hotroot Soup the other day. Now I'm writing the recipe down in case this is making you start to crave a bowl of steamy, spicy, potato-y goodness. *he loved it, by the way. Black pepper, red pepper, and (if possible) white pepper. Chop the veggies and cover with broth, toss in the rosemary and cook until veggies are tender. Fry the bacon and add to the pot. Start seasoning away with the salt and peppers, adjusting the taste until it's nice and peppery. Serve steaming hot with crusty bread (you can also toss some grated cheese and crushed crackers on top as well). My son is a huge Redwall Fan as well. We have read all the books and were so sad to hear a few years back that Brian Jacques had died. We have made a few of the recipes, I have one for 'Strawbee Scones' that is really good. Great memories! Raquel, we were so sad to hear the news of his passing also. I love meals based on works of fiction! Brenda, so do we! It's such fun, isn't' it? oh damn, that sounds good! Julie, it's so good--I'll have to make it for you guys when we come up! Only a few more weeks! (we'll be there for Thanksgiving! ).